A few questions answered by Ron…. SBN: You were taught and mentored by two great ladies in our industry, Betty Van Norstrand and Martha Stewart, what did you learn from each of these women? RBI: Betty was a great teacher. She, like me, is very interested in technique. Betty is also very organized and methodical. She would teach the method of how to do something and then push her students to turn it into their own creation. I was never a fan of piping, and Betty introduced me to silicone molding. I was never one to have a hobby, so when I was interested in something it generally became my profession. Martha Stewart was the first to put one of my cakes in her magazine. She took me on the Oprah Winfrey show. Martha was the catalyst for me opening my own cake shop. 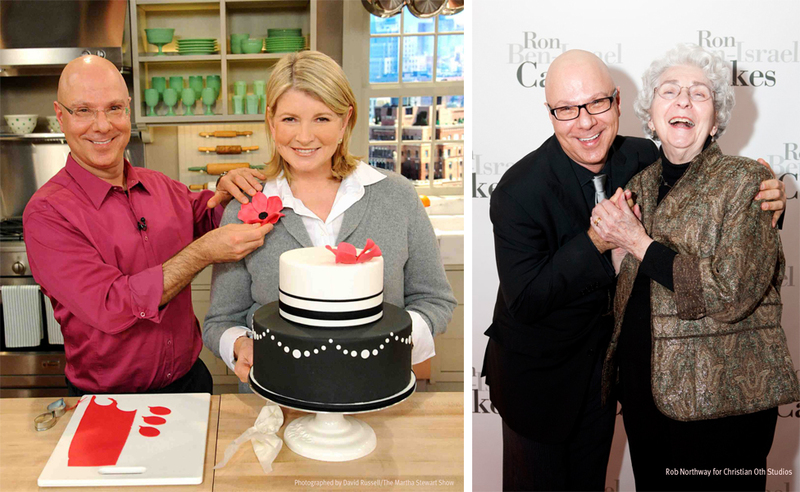 Two Industry greats are Ron's teachers: Martha Stewart and Betty Van Norstrand. SBN: You take pride in sharing your secrets with students, what do you enjoy most about teaching? RBI: When I teach a class is it a chance for me to get out of the bakery and just focus on the task at hand without any interruptions from staff, clients, phones, etc. It is like meditation for me. I love academia it gives me a sense of growth and contribution. It is also a great place for networking and sharing ideas. I do love to share my knowledge with my students in a classroom setting. Unfortunately, I do not have the time to help people when they call my shop for advice and help. I am very busy and focused on my staff and clients when I am at the shop. I love for people to come and take my classes to learn from me. We offer a very competitive internship at the bakery. Ron takes time out from working with the staff to sit with interns and teach them specific flowers. Taking Ron’s sugar flower class in Savannah was an amazing experience I’ll always cherish…I highly recommend taking his classes to every cake artist. It’s the best investment in you business you’ll ever make 🙂 Love you Ron!…and Rebecca…love your blog! I took a class from Ron in Toronto, it was such a great class. Way more taught than just sugar flowers. I’ve had the pleasure of interning for Ron and it was a great experience. I learned a lot and am in the process of opening my own shop (one day very soon). Thanks Ron. Wow !!! This is like my dream to have a class or internship at Ron’s and with Ron !!! He seems like the best teacher ! Lucky you to have had an opportunity to meet with him ! I hope one day my turn will come ! Thanks for this blog too, it is very interesting to read how things goes in a successfull bakery like yours ! I would have tons of questions to ask, but you wouldn’t have time to answer them all !!! I took a class with Betty in Toronto, she was amazing, so patient and funny. She was so inspirational……so down to earth…..and she has the most beautiful skin to boot! ← Sweet Genius? Yep that’s my boss (and the title of his new TV show! ).